The second volume of Jane Goodall's remarkable self-portrait in letters, Beyond Innocence details some of the eminent scientist's greatest triumphs and her deepest tragedies. It covers the years following the publication of her groundbreaking book In the Shadow of Man, which, along with her articles in National Geographic, made her famous. Goodall's candid letters recount major events in her life and research, including her astonishing discoveries about chimpanzee behavior, the birth and raising of her son, the breakup of her marriage to Hugo van Lawick, the kidnapping by guerrillas of a group of her students, her marriage to Derek Bryceson and his death, and her growing concern about the future of her beloved chimpanzees at Gombe and elsewhere in the world. 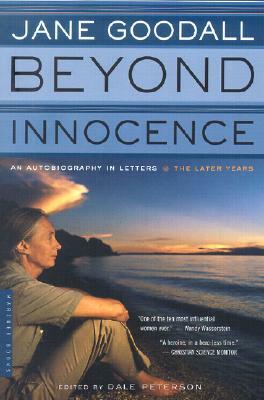 Beyond Innocence tells how many of the dreams of Goodall's youth were shattered, but also how she changed from a rather private observer to a public crusader. Dale Peterson is the coauthor with Jane Goodall of Visions of Caliban (a New York Times Notable Book and a Library Journal Best Book) and the editor of her two books of letters, Africa in My Blood and Beyond Innocence. His other books include The Deluge and the Ark, Chimpanzee Travels, Storyville USA, Eating Apes, and (with Richard Wrangham) Demonic Males. They have been distinguished as an Economist Best Book, a Discover Top Science Book, a Bloomsbury Review Editor's Favorite, a Village Voice Best Book, and a finalist for the PEN New England Award and the Sir Peter Kent Conservation Book Prize in England. He resides in Massachusetts.